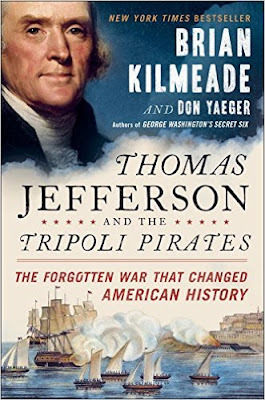 Philip Kopper offers a review in the Washington Times of Brian Kilmeade and Don Yaeger's Thomas Jefferson and the Tripoli Pirates: The Forgotten War That Changed American History. As a scholarly truism holds, “every generation rewrites history to suit itself,” the same might be said for every historian, and every news anchor who wants to be one. Brian Kilmeade of “Fox and Friends” (with ghostwriter Don Yaeger), gave us “George Washington’s Secret Six” and now has penned another look at our Republic’s early years through a lens ground to his own prescription. This is not to say that all views here are uniquely skewed, for President Jefferson’s Barbary Wars launched the young nation on an unexpected course and proved our Navy’s strength, which a decade later enabled us to beat Britain in the War of 1812 and really change history. But this is to say that the authors let historical idealism bend their narrative, and that they admit a hidden motive for the entire exercise only two pages before the epilogue. Facts or nuances are often fudged to accelerate a narrative’s pace; so be it. But it seems disingenuous to hold back a book’s core thesis until a peroration declares: “Most important, here in the twenty-first century, the broader story — the great confrontation between the United States and militant Islamic states — has a new significance.” That notion strains credibility, because real similarities between the historical “then” and the international “now” are as thin as parchment. ... In this account sentimentality competes with valor and wins; patriotic hyperbole beats historical exposition. In describing wars that were largely maritime, the authors founder as they describe a vessel “at full sail” and “cannon mounted at the front of the ship” and Philadelphia leaning “sharply to one side.” They pluck at our patriotic heartstrings invoking Jefferson as he considers bringing his daughter across an ocean teeming with pirates who sell their pretty captives into fates proverbially worse than death: “As a father he could feel in his bones a fear for his daughter’s safety. As an ambassador and an American, Jefferson recognized it was a fear no citizen of a free nation embarking on an oceanic voyage should have to endure.” Call it patriotic drum-thumping or history lite.